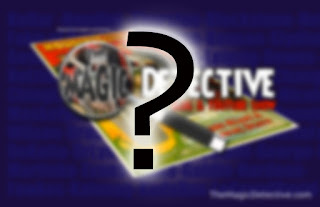 Carnegie: Magic Detective: Magic Detective Vanished??? Sorry for vanishing on you though it was not on purpose. There was a minor complication with my site that caused it to dissappear. I was unaware that the site had been down until I started getting emails from my readers. It's been a very frustrating day of trying to figure out what happened and getting it resolved. You'd think it would be an easy fix, but that was hardly the case. The good news is it's back up and running and viewable by the WORLD! Thank you to everyone who alerted me to the problem and for those who helped in getting it fixed and back up!